Despite all of Gabes amazingness, he does struggle with speech. He is great at single syllable words but often leaves off the last sound; cat=cah, dog=doh. He is wonderful with frequently used words; Mommy, Daddy, sister, NO! and bad dog, are all clear as can be. He can put small words together to make requests; “milk please”. But unless you’re around Gabe as often as we are, or your familiar with the signs that he uses along with the words he says, it can be hard to understand him. Even I have trouble some days. But! That doesn’t stop him from getting his point across. He recently had a tonsillectomy and it made his voice and words even more muffled than usual. I was experiencing a great deal of difficulty understanding him and he was pretty frustrated with me. Usually he will use sign along with his words to tell me what he is needing, but this specific day he was just too uncomfortable, tired and frustrated. After repeated failures of understanding what he needed, he turned around and huffed out of the room. I didn’t go after him as he will usually return after a few moments and try again or change his mind and do something else. He was gone for maybe ten minutes. When he returned to sisters bedroom where we had previously been trying to figure out what he needed, his desire was VERY clear. He was dragging with him a jug of milk, and carrying not just a sippy cup, but a matching lid as well! I was awestruck. Not just by him figuring out a way to communicate his needs but by everything that he had just accomplished. 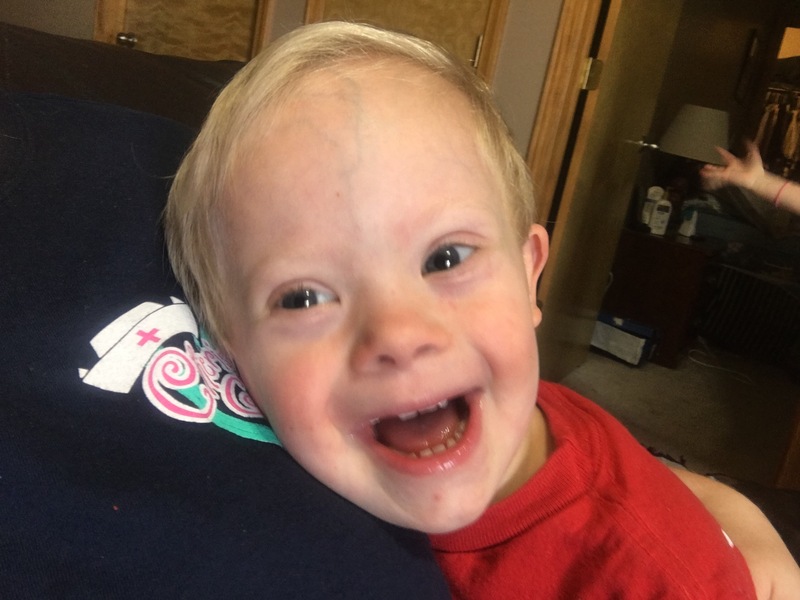 I’ve talked before about the challenges that Gabe faces and how that extra chromosome of his can make things harder for him. Motor planning (thinking about what your body needs to do and then doing it), problem solving and critical thinking are difficult. But Gabe continues to find ways to complete these tasks and surprise us! Aside from the strength it takes for a little 28 pound boy to yank open the fridge door and pull out a jug of milk. He then dragged it out of the kitchen and down the hall! Before he did that though, he knew that he needed something to put it in! Not just any something, but specifically a sippy cup WITH a lid. We have a variety of sippy cups in the kids’ drawer, they’re tossed in there with the lids mixed in. Gabe had to sort through, pick out a cup AND a lid that matched each other. He did. He brought that matching cup with lid along with the jug of milk all the way into sisters room for me to pour him something to drink. When I took stock of what all he had returned with, I was shocked and overjoyed. Gabe had taken it upon himself to show mommy what he needed when I couldn’t understand. But it was so much more than that too! It was critical thinking, problem solving, strength, motor planning, sorting, matching, and it was amazing. This little guy doesn’t let others ability or inability to understand him stop him from expressing his needs! He is determined and creative and I am once again in awe of this little guys resourcefulness and determination!